Palos Hills IL Dentist | Sedation, cosmetic, family, general & implant dentist! Dr. Anthony Tisoncik has dedicated 33 years to delivering patients quality dentistry for a lifetime of healthy, beautiful smiles! He places strong emphasis on being an honest, gentle, compassionate dentist who treats patients, not just teeth. Dr. Tisoncik received both his bachelor’s degree and dental degree from Loyola University in Chicago. He is a member of the American Dental Association, the Illinois State Dental Association, and the Chicago Dental Society. 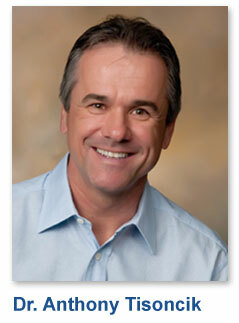 Committed to lifelong learning in dentistry, he regularly completes numerous continuing education courses every year. He has received specialized training for IV sedation from the anesthesiology program at the University of Southern California and attended the Kois Institute for Advanced Dental Studies in Seattle, Washington. He is also a graduate of Temple University and Misch International Surgical Implant Institute. Dr. Tisoncik’s many years of experience and advanced training in cosmetic, implant, and sedation dentistry allow him to work with you on a wide variety of dental issues, developing a partnership in achieving optimum oral health. He has created a state-of-the art practice that offers comprehensive dental care all in one place, so there’s rarely a need to go anywhere else! Using today’s digital and 3D imaging, intra-oral cameras, lasers, and sedation dentistry, Dr. Tisoncik can deliver dentistry that is more comfortable and less invasive than ever before! When not in the office, Dr. Tisoncik enjoys spending time with his wife Nejah, daughter Alyssa, and son Michael. His enjoys playing golf and exercising. He is also an avid runner and has completed seven Chicago Marathons. Dr. Tisoncik is looking forward to meeting you and discussing your dental needs. Give us a call today at (708) 599-2929 to begin the first step toward your healthiest smile.